Your excellency, in which position during your career, from the South Sudanese Liberation Movement to the Ministry of Foreign Affairs, do you think you gained the most experience and which one did you find most challenging? Before I start, let me say thank you for coming here on behalf of Berlin Global. I am really glad to be with you in this interview. About your question, I had been in the Liberation Movement since 1985 until the time we had the Comprehensive Peace Agreement (CPA) in 2005. I joined the Ministry of Foreign Affairs after the CPA, because there was a quarter for the Civil Society Organization in the government of Sudan. In 2007 I worked in the Ministry of Foreign Affairs in the department of Planning. After that, in 2008, I had been deployed to Vienna, where I worked for three years and 8 months almost. After that, there was a referendum in which the 98 per cent was for separation and thus we became an independent country on 9th July 2011. One of our new ministries was the Ministry of Foreign Affairs, an amalgamation of three departments ruling the South Sudanese government at that time. The staff from the Ministries of Foreign Affairs, International Trade and Regional Cooperation, all became staff of the Ministry of Foreign Affairs and we worked as ambassadors for the Republic of South Sudan. Then I was deployed to Germany in which I arrived at the end of July 2012 and I presented my credential on 24th August. About my experience, I have a long one in the Movement as I told you, from 1985 until 2005. But the experience in the Ministry of Foreign Affairs is not that much different from the one in the Movement, because we were going out to talk about it, about peace, human rights and other issues. So in that position I had been an ambassador of our Movement. Actually, that was my next question. Since your academic career began in physiotherapy, how did you decide to become a diplomat? That is a long story but I will try to make it short for you. As a student in Cairo University I entered the biggest quarter for scholarships from Egypt to students coming from the Republic of South Sudan. While we were there, we formed an association called SOSA which worked for the students’ rights and I was one of its members as a leader. When I came back I worked in a hospital as a physiotherapist but we continued our relations as students and worked for the rights of people in the South. At that time, in 1983, we had the problem of sharia law. Our political orientation made us think about what was going on in South Sudan, what were its burning issues, what was happening in our country. During the time of sharia law, the rights of people of South Sudan had been discriminated since the majority of them were Christians. Also we did not have the luck of a government that developed the country, although all resources were coming from South Sudan. We had identity issues, issues of resources and development and as intellectuals we thought about them. There was the movement Aniania 1, that started in 1955, when our fathers and grandfathers had called for autonomous government. They entered the civil war in 1955 and ended it in 1972 with the Addis Ababa Agreement. Before 1983, they developed another movement called Aniania 2. Because of the sharia law, we developed the South Sudan Liberation Movement (SSLM) and the South Sudan Liberation Army (SSLA). With all these happening in Khartoum with discrimination, we thought our people were targeted and that made me join the Movement. I left Khartoum in the end of 1984 and by May 1985 I had joined the Movement in Addis Ababa. How important is the role of being the first official head of mission for the independent Republic of South Sudan in Germany? What are your main goals whilst holding this position? Being the first Ambassador for the Republic of South Sudan in a big country like the Federal Republic of Germany is a big and challenging task. We have built all these from nowhere, we had to find the office, the residence and at the same time we had to bring our name out. That is the most important thing because, even if our country got independence and they know it, they do not know it from its political and diplomatic perception. 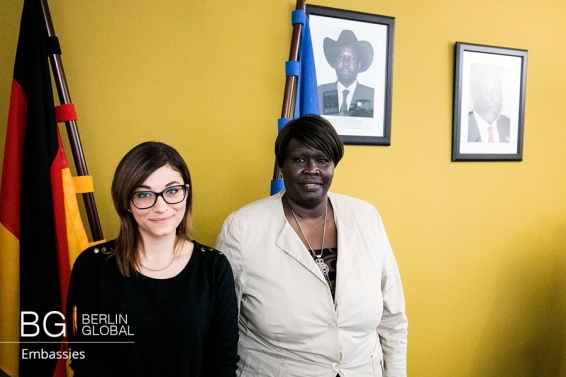 We must work according to the Vienna Convention and foster the cooperation between Germany and South Sudan, to make ourselves known, to network with other organizations and embassies, to give information to the media so that they can find out what is really happening in South Sudan. With all these in our mind and at the same time with all the tasks given to us by the President, we have to work for investments in our country, to defend our country’s name. For the first two years, we had to represent ourselves like “Look we are here. We are present”. That needed a lot of effort because we had our own activity so that many people could know that we exist. This is a challenging situation and even more when you are a female ambassador I think. But we have done it. How would you evaluate the relations between South Sudan and Germany and how do you believe these relations have evolved since the independence of South Sudan in 2011? Actually the relations between the Federal Republic of Germany and the Republic of South Sudan have been good, because we had relations even before our independence, especially in the medical field and others like this of peace. But the most important was that in the first day of our independence we had been immediately recognized by the German government. That was in the 9th of July 2011. We had an office here before, that has been turned into an embassy now. That made many more countries in the world recognize the Republic of South Sudan very fast. South Sudan became the 183rd country of the UN and the 94th county of the African Union. Also Germany helped us with many projects and as I have mentioned before, they have a project in the medical field but also one in the peace process. Even now they have a project in governance, in agriculture, in water and in capacity buildings. This means that our relations have been fostered since our independence. Many people from Germany, the government, the Bundestag, the Ministry of Foreign Affairs have visited the Republic of South Sudan as well as our Ministers have payed visits in Germany. We have good relations, good cooperation and we understand that we are partners and we are working as such because we are part of the Development Aid. So we have also the privilege to get the Development Aid as a partner. 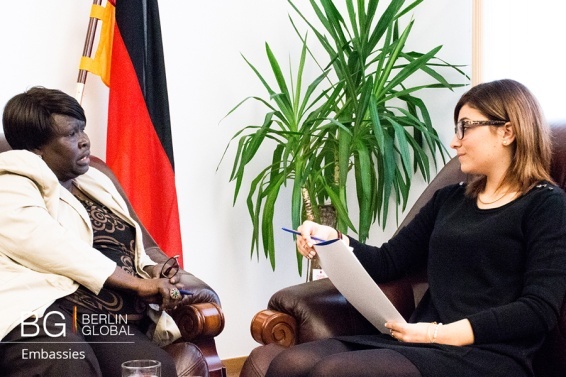 What do you consider to be the most important issues of cooperation between South Sudan and Germany? In which areas do you think there is space for improvement? Actually the most important areas we are working in are agriculture and water. There is space for improvement in the fields of health and governance. And even in peace you know, because in my country since our independence we have also our movement. It was not very easy but it is in our soul and because of that we feel like Germans, that we go through the same that Germany has gone through before the separation, how it was unified and how the federal system started. We have as well chosen to have a federal system but it is different. So in such fields we can work together and improve our situation in the Republic of South Sudan. Do you think that Cultural Diplomacy could eliminate differences between states and prevent conflicts? Could this goal be achieved in the case of South Sudan? Yes, Cultural Diplomacy is very important between regions, tribes, communities, because its language is understandable for all the culture we have. We are cultural people by nature, we love our community and our culture. This is one of the things that bring communities together when they sit and try to understand each other. There are some areas, in the borders for instance, where you can find a community that it is the same in South Sudan and at the same time in Uganda, in South Sudan and Kenya, in South Sudan and Congo. So, we actually connect with our neighboring countries and link with our own communities. We have more than 62 tribes and each one neighbors with other tribes that have similar cultures. With that understanding of Cultural Diplomacy, I think it can play a big role especially in the peace process. How is the Embassy trying to promote the South Sudanese culture in Germany? We are promoting this culture by showing it everywhere. Specifically, we have some forums, like BMZ for instance, where cultural partners can present their culture during the open day they have for the public. We participate there since 2012 so as to show to the German public our culture. Sometimes we organize cultural activities in the Embassy. We also call the local community for meetings in which we can also present our culture. sometimes there are also parliamentarians who have activities in their hometown and they invite us to go and show our culture. Even in our office you can see that all the things represent our culture. As I told you, we are a diverse community with 62 tribes and we have to show all of them to the German public. Our Embassy is always open to the public to come and see our culture, sometimes we bring singers and dancers and he also have a fashion show. We want to promote our culture in Germany. During the last years tourism has been a profitable activity in South Sudan. Do you believe that it can be good means for spreading your culture abroad? If you refer to the ITB in Germany, it is a good forum because it is an international one with thousands of participants. There, we present our culture and areas of our countries that were never seen before and probably they do not even know about them. Now there are many tourists that come to South Sudan because of our activity and what we show to them that is different from Kenya, Tanzania, Uganda or Ethiopia. It is better if you can tour in the beginning because the migration of animals starts from South Sudan. We have many rare species and many other things that people do not know about, like our forests which are very rich. We have water resources and beautiful landscapes. Most of the things shown in the media are about war and conflicts but we have to portray ourselves differently from what they see to the media. Finally, what advice would you give to young people who are interested in a career in international relations or diplomacy, but whose academic career has not begun from international relations? Thank you for this question. As a human rights activist, I believe that youth should have its space and its chance. We tell them always that they are the future of the country but we do not give them what they deserve. I believe that in the fields of Public Diplomacy and Cultural Diplomacy we have to be open. But an open mind could not come if you are just close to your books, your university and your own country. You should be exposed outside so that you can know what is there. What you hear or what you see is not the same with what you see in the news or what you read in a book. If you go there, you will learn things that you will never learn from the books. I firmly believe that youth has to take the challenge. But the challenge starts from yourself, when you really want to make a difference in your life and to look at the recreational life within you. They say “I want to do this because my friend is doing this”. That is what I always tell to my son, “My son always plan for yourself, do not let anyone plan for you. Be the leader of yourself, do not let anyone lead you”. And that is what I want to leave to the youth. Do not let the others lead you and do not let them tell you that you will be the leaders of the future. You have to be the leaders of today. You have your space and you have to lead it, you have to seek how you will lead the future. Yes, the future is yours but today is yours as well. So, work for today as you will work for tomorrow. Is there anything else that you would like to comment or add? I want to comment your effort; you are also young and you look into a different diversity. That is very important, because you could have an interview with any other but you chose an interview with an Ambassador of a new country. That is an appreciation and that means that you are widening your scope, your mind. All countries are the same but some people thing that there are countries and names bigger than others. But no, we are here to represent our country, our government, our President and all of us are equal. All of us can give a message that people would really want to hear.